Yeah, yeah, I know this is completely and totally late. If you view time and space as a linear progression that is. Anyway, I found this little photo gem in a quite old book in my collection and wanted to share it. 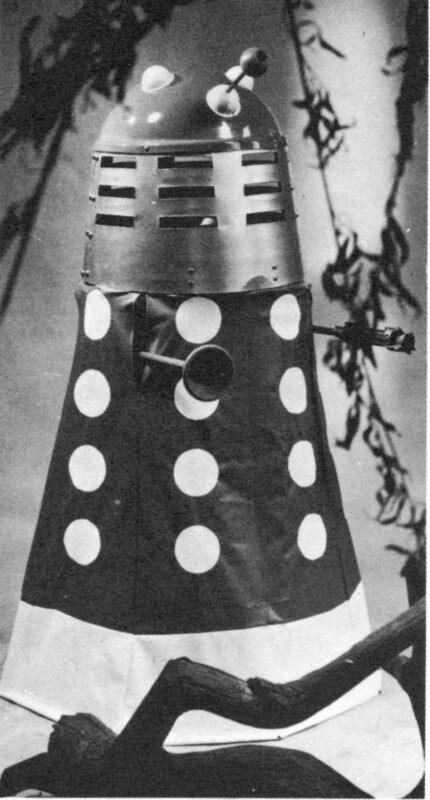 Yes indeedy my timey wimey friends, a photo of an authentic Dalek dressing-up suit. Which moment in the above mentioned Adventures in Time and Space made me laugh out loud. That little girl was just soooo thrilled to be dressed up as a Dalek it was impossible not to laugh. On a technical note it was interesting to see how the dressing-up suit was constructed. The body is fabric suspended from a hoop that hangs just below the shoulders from suspender straps. This same hoop forms the support for the helmet which fastens on with snaps. This was a smart design decision: the helmet is supported by the shoulders and leaves the child’s head unencumbered. The two appendages are made of plastic and the rods enter thru the side slits and are held in the child’s hands. You really weren’t meant to stick your arms out the slits . . . but it was handy that you could so as to pull in an emergency sandwich or beverage. After all being a Dalek is thirsty work. I wanted to get this posted before Thanksgiving as a reminder that sometimes you just have to get wacky in the face of disfunctional situations. It is my most sincere hope that even without said reminder if you found yourself in a unduly difficult place that you found the strength of character to slap a colander on your head, pick up a whisk and say (in a loud, flat, metallic voice) to all assembled: Exterminate! Exterminate! If nought else, it would certainly shift the mood.